This "About" page has been empty for years because I didn't know what to do with it, but now I think it might be fun to chronicle how the site has evolved over the years. It's always weird and awkward when an author introduces themselves on the web but I'm going to do it anyway. I am Myles Skinner, also known as Shamus in the MUD. I've been around the internet since before the web was a thing—I remember at the time thinking that the whole WWW endeavour was a waste of time and would never catch on. (Well, I was half right.) 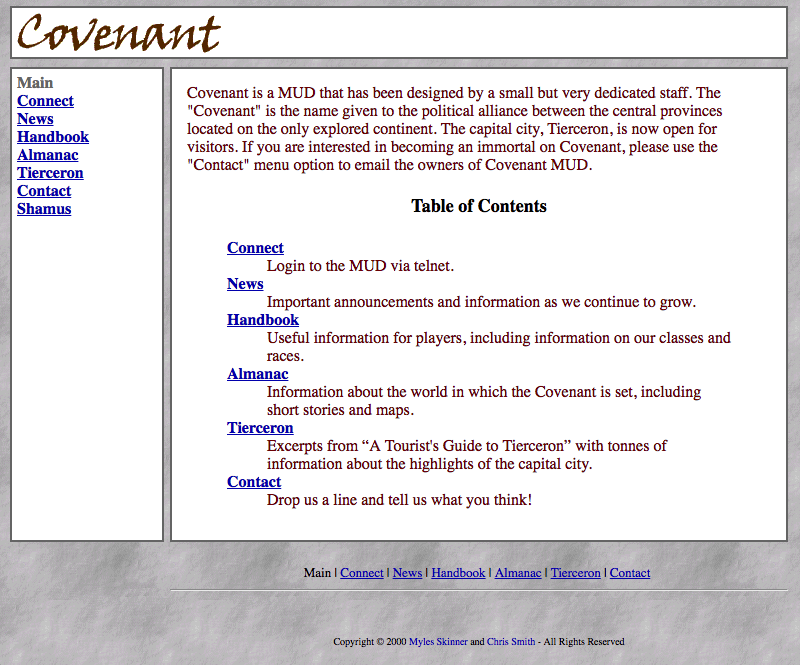 I've also been involved Covenant MUD since the very beginning and I've seen all the changes. Let's talk a little history, shall we? Long before we registered tierceron.com, Covenant MUD was hosted at quandary.mudservices.com, on a machine called "soap". The MUD itself was called "TMP", which stood for "TMP MUD Project"—TMP being standard computer jargon for "temporary" and recursive TLAs being an industry tradition. The site launched on 05 May, 1998. 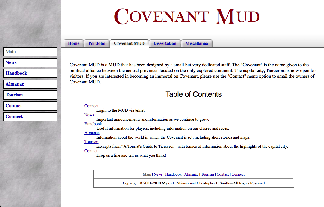 By then, we'd settled on "Covenant" as the name of the MUD, and Wrathmolten created the pages and added the initial content. He also drew the logo—a magnificent early-web specimen featuring rainbow "web-safe" colours and thick, nested ellipses. Behind the scenes, the site was built with HTML tags in ALL CAPS, employing deprecated tags like <FONT> and <CENTER>. The very first bit of page copy optimistically declared, "This is the Covenant Information Page. You may soon find valuable player information located on these pages." In 1998, most players would connect to MUDs via telnet from their shell accounts, and it was still reasonable to expect that a significant percentage of our visitors would be browsing our site with Lynx, a text-based browser. As such, there were few images on the site and all the pages rendered cleanly in a standard 80x24 character terminal window. In true 1990s form, the main page contained only 88 words and yet managed to include the phrase "under construction" twice. We registered tierceron.com on 18 July, 2000. 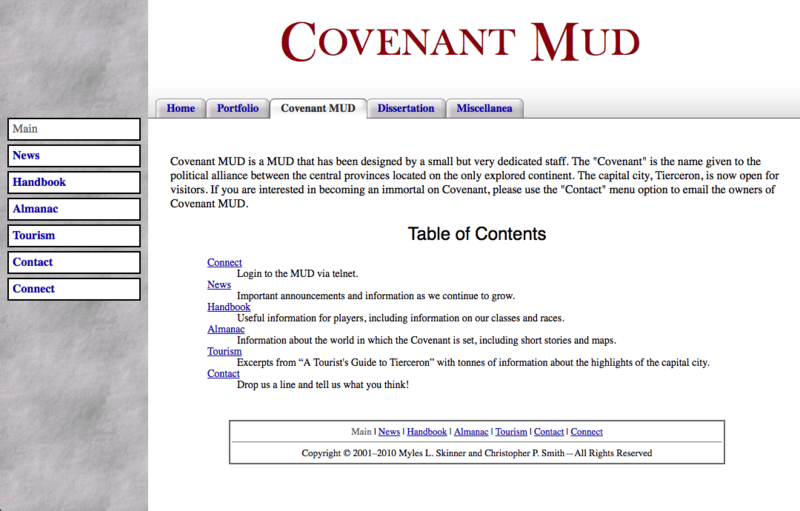 We'd been hoping for covenant.com but that domain belonged to a beverage company (as of 2019, it belonged to a technical support company), so we ended up naming our domain after Tierceron, the main city and centerpiece of our MUD. To improve the focus on the city, Gailyana and I sat down and wrote The Tourist's Guide to Tierceron which is mostly useless for players but does supply a nice bit of background colour for our world. For this iteration of the site, we built the layout upon HTML tables. Layout tables are no longer considered a good practice, but at the time, you either made tables or you used frames, and frames are objectively terrible. We weren't sold on this new thing called "CSS", which was only two years old at the time. The monolithic grey background hearkens back to a time when literally every single page element competed to be the focal point of a website. While tame for the era, the textured background does overwhelm the content, and as a result, the site design feels cramped. A typical web browser would be looking at our site at a horizontal resolution of 800 pixels (pictured), although a number of users still visited us with resolutions as small as 640 pixels across, a viewport size that further reinforced the cramped feeling. In 2002, Wrathmolten recruited me to write a Java application to support his new online store, RPGme. 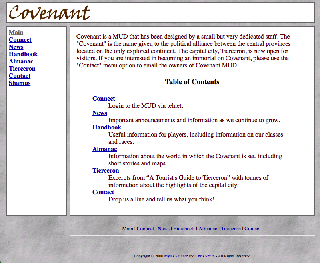 In the process, I learned how to use CSS, and decided to apply that knowledge to the Covenant MUD website while refreshing the look. I removed the layout tables and built a more modern template. I confined the grey background to the left navigation sidebar, giving the site a little more room to breathe. This look is clean, but also a little bland. But, then, I survived the web of the nineties. I think we all needed a little blandness at that time. The first versions of this page did not include the tabbed navigation elements along the top; the tabs were added in 2010 because links to my personal projects were beginning to add clutter to the MUD site. The tabs are composed of a number of smaller images that are tricky to keep aligned and tended to break in earlier versions of Internet Explorer. The new site was implemented in a clunky (but functional) custom framework written in PHP where all the navigation menus and individual page layout elements are generated from a few variables. Copyright © 2001–2019 Myles L. Skinner—All Rights Reserved.